Seabury Hall is currently under construction. The construction forced the closing of the Great Room for the 2013-14 academic year, a popular North Campus dining spot. As of this academic year, students will no longer be able to indulge in Sunday night hot cookie bar at 1835 Hinman. The dining hall, which in previous years has stayed open on weekends, will now close after dinner Friday to reopen on Monday, nuCuisine marketing manager Jason Sophian announced last week. Instead, Allison Hall’s dining area, formerly open only on weekdays, will now be an option seven days a week. 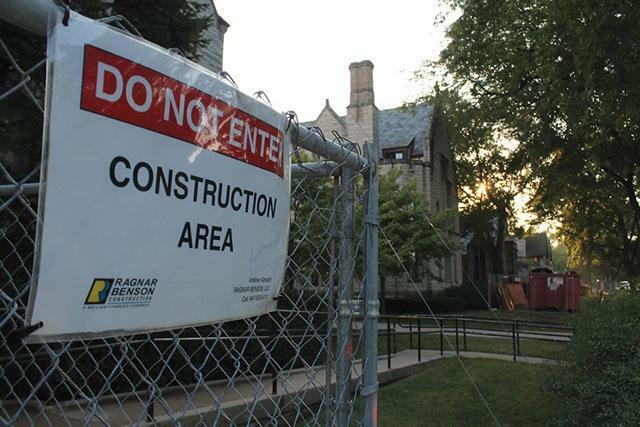 In addition, the Great Room will no longer be a dining option due to construction at Seabury-Western Theological Seminary. The space formerly occupied by the dining hall will now be used as a catering location, Sophian said. Whether or not the Great Room will be restored as a dining option after construction is completed remains to be decided, Sophian said. Although the Great Room closing was prompted by construction, Sophian said the decision to switch weekend dining on South Campus from Hinman to Allison was based primarily on student feedback. Medill sophomore Ben Sanders, who is living in Allison for a second year, said the weekend hours are a big improvement. “Now I can stay in my pajamas and walk downstairs to breakfast instead of going all the way to Hinman,” Sanders said. In addition to the changed hours, Sophian said the food selection at every dining hall will be different from previous years, with more diverse offerings at each location. Norris University Center will also see revamped selections with the addition of Subway, which Sophian expects to open in October. The Varsity Grill will receieve an updated menu in an attempt to make up for the loss of the Great Room. The revamped Varsity Grill will feature made-to-order burgers, hand-cut fries and a new name to be voted on by students. Sophian said nuCuisine is also working to bring a wider array of cultural options to the Norris food court, including Indian food. “The idea is for it to be a nice little hub where you can get anything you want,” Sophian said. Campus convenience stores will be updated this year with a new program called C-Store +, which will allow students to place grocery orders through their nearest C-store. “We wanted to develop a way for students to be able to stock up on groceries without ever leaving their dorm,” Sophian said. As for Hinman’s hot cookie bar, Sophian told students not to worry – nuCuisine is working on finding a new day for the dining hall to offer its famous half-baked cookies. “I can tell you that’s something that we do not want to go away,” Sophian said.